Sometimes, I feel like I’m on a life-long quest to convince people to give poetry another chance. For some reason, so many people I encounter have such negative views about poetry: perhaps PTSD from high school English classes or negative experiences with overly obscure poetry. A lot of people don’t find poetry accessible, especially contemporary poetry. While I’m not always a fan of the extremely ambiguous or minimalist poetry that is pretty trendy right now, I find that there are still lots of poets who employ beautiful, spellbinding imagery and emotion. 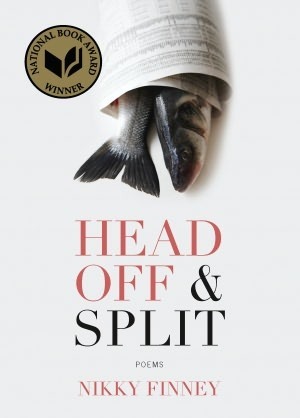 One collection that really spoke to me recently because of its clear and powerful message is Head Off & Split by Nikky Finney. This collection won a well-deserved National Book Award, and it is a truly inspiring collection of poems that focus on civil rights, racial relationship, and even family dynamics. So many of these poems feel deeply personal, especially the title poem which was mesmerizing. Finney is an amazing poet who has been overshadowed until recently, but this collection is surely going to keep her in the limelight for a while. I would definitely recommend this collection to anyone who either loves poetry or who wants to explore how modern poetry relates to the present political climate. Poetry has always been used as a way to critique society, and Finney continues that tradition today.